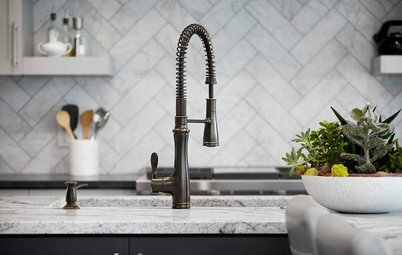 Artistic, design-forward surfaces for everything from the kitchen sink to the kitchen wall were on display at the Kitchen & Bath Industry Show. 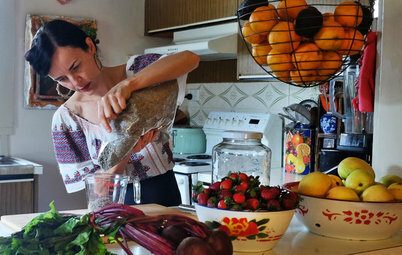 The industry’s biggest event in the USA, the trade fair was held in Las Vegas from 19 to 21 February, 2019. 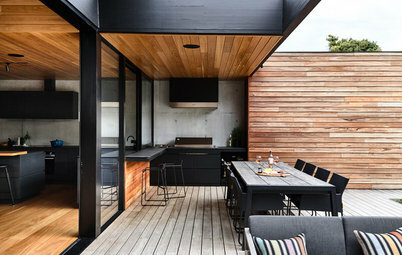 Houzz spotted designer-and-artist collaborations with brands that have resulted in unique surfaces that elevate the look and feel of a home. 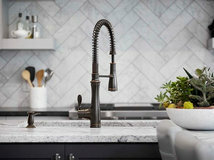 Read on to learn about some of the standouts we spotted for the kitchen and bath industries. 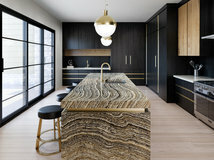 While The International Surface Event, held in Las Vegas in January, is the premier event for the tile, stone and floor-covering industries and a showplace for beautiful surfaces, KBIS nonetheless had plenty of artistic surfaces on display. This room inside the Kohler booth stood out with three gorgeous new products: a new type of marble, a tile made from factory waste and a hammered sink. 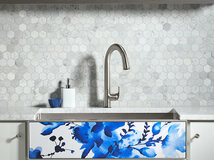 Interior and product designer Mick De Giulio – whose designs are featured at the presidential guesthouse in Washington, USA – designed the Bacifiore sink, pictured here, for Kohler’s Kallista brand. Its polished and distressed stainless steel is hand-hammered to create an organic motif. 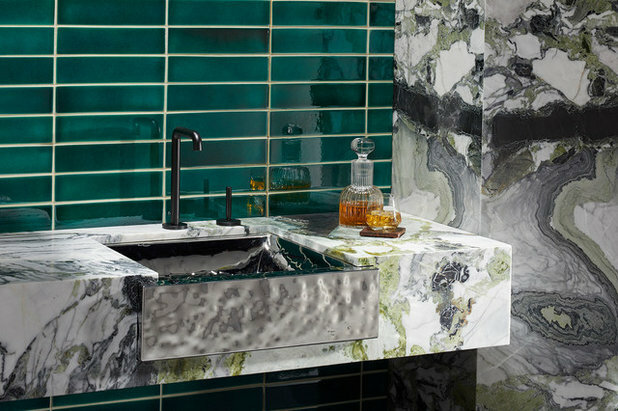 The vanity shown here uses the new and dramatic Scala marble from Kohler’s Ann Sacks brand. It features a white background with veining in green, grey, sapphire blue and black. The green tiles are composed of unfired pottery waste – in other words, scraps of ceramic, sand and dust from the tile factory – that forms a beautiful crackled pattern after it is fired. This tile is the only one on the market made from pottery cull and foundry dust as well as waste glaze. 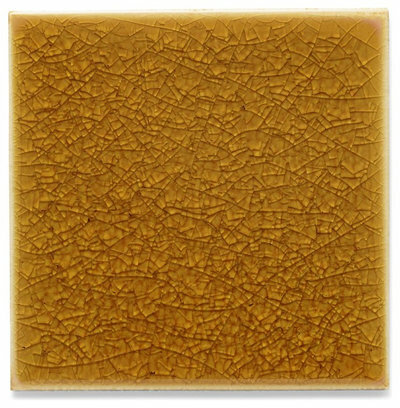 Part of Ann Sacks’ new Crackle collection by Kohler WasteLab, these tiles are available in six colours: amber (shown here), bone, emerald (shown in the previous image), lake, mahogany and turquoise. This image reveals a closer look at the crackled surface. 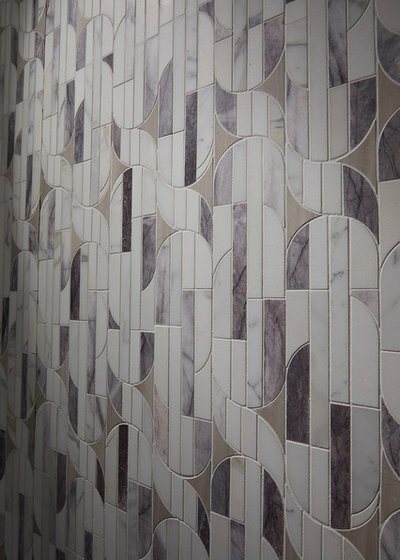 Ann Sacks debuted another marble, Lilac, as part of the Liaison collection by interior designer Kelly Wearstler. Shown in this image of marble tiles, Lilac is the soft grey-violet marble with cream veining. It is also available in floor tiles that radiate outwards in a sunburst pattern. 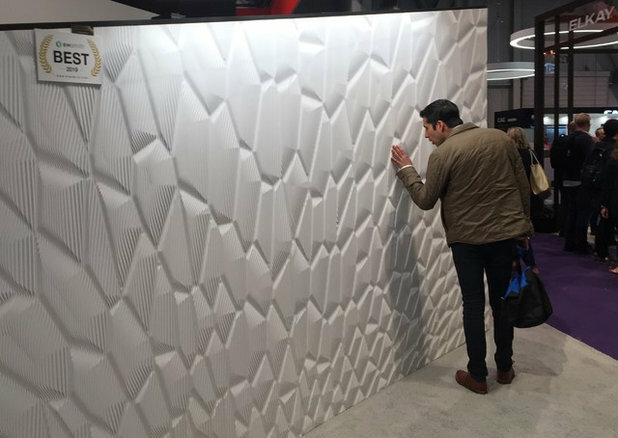 Corian introduced an interesting way to use its solid-surface material: as textured, sculptural tiles. 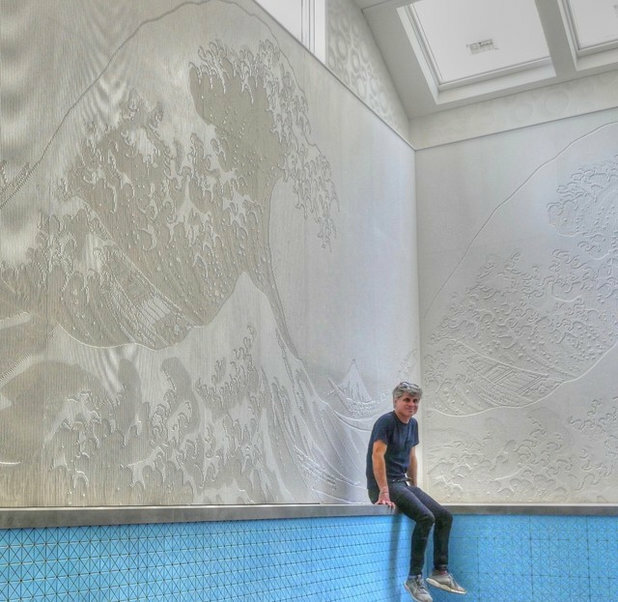 While the brand’s solid surfaces are known for being perfectly flat and smooth, Los Angeles artist Mario Romano has created 40 designs with carved surfaces that have a raised pattern. The patterns include a series of raised hexagons and ones that resemble a honeycomb, a sunburst, the lines of a planetary orbits and the outline of a mountain range. The designs, in a line named M.R. 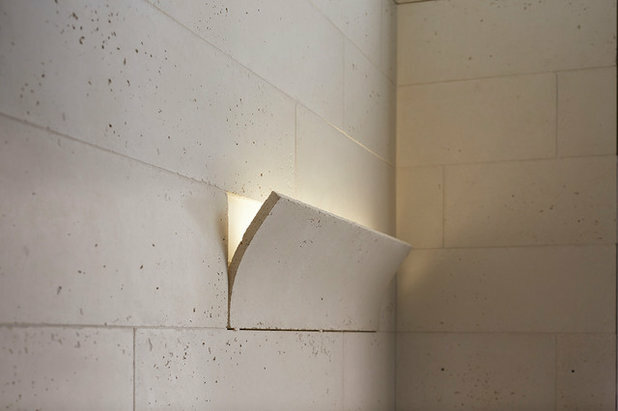 Walls by Mario Romano, come in irregularly shaped puzzle piece-like tiles that fit together neatly and show no seam. 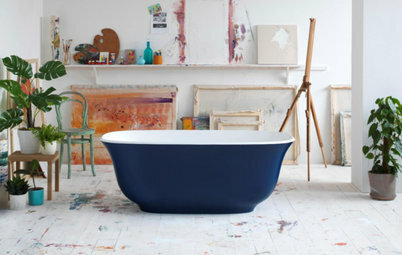 They can be used on kitchen splashbacks or shower walls, or as decorative installations on surfaces throughout the home. The innovation won a BIMsmith Best of IBS/KBIS 2019 award, one of just 12 products to do so. Here’s another use of the routed tiles in Romano’s Great Wave pattern, above a pool in a home. 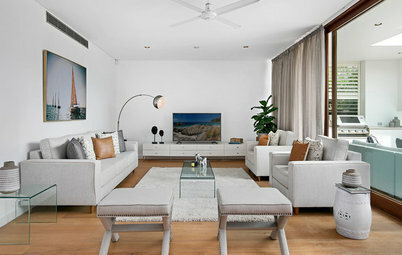 The artist can also create customised patterns for homeowners. Ann Sacks also debuted its Pas Deco curved and flat concrete tiles, a collaboration with Israeli product designer Itai Bar-On. The curved tiles have a solid brass border. Here, the tile is lit from behind with LEDs that accentuate the curve. 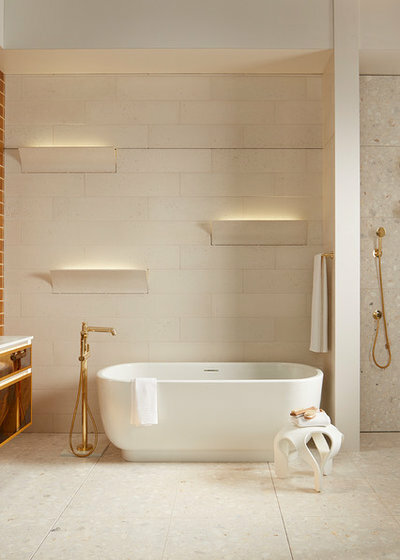 This image shows the Pas Deco tiles applied in a bathroom setting. Notice the brass fixtures – another continuing trend we observed at KBIS. 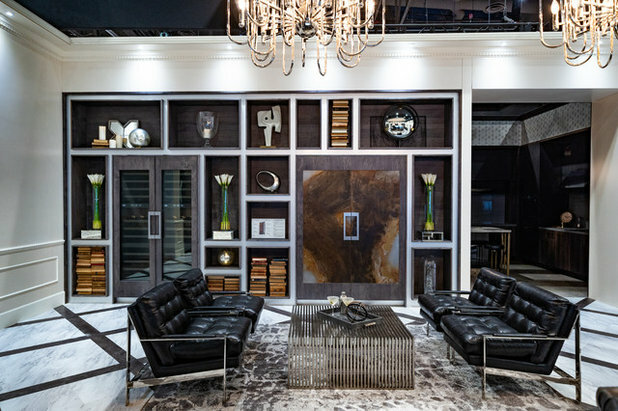 Dacor’s booth displayed the scene shown in this image, including column wine refrigerators (seen on the left-hand side) and a dramatic and elegant refrigerator (seen on the centre-right of the wall). This refrigerator was introduced at KBIS last year. This year’s model has custom panel doors designed and built by Brooklyn, New York, furniture maker Mark Jupiter. The doors are stainless steel with a custom hand-applied patina, and homeowners can select the same look on this product if they desire. 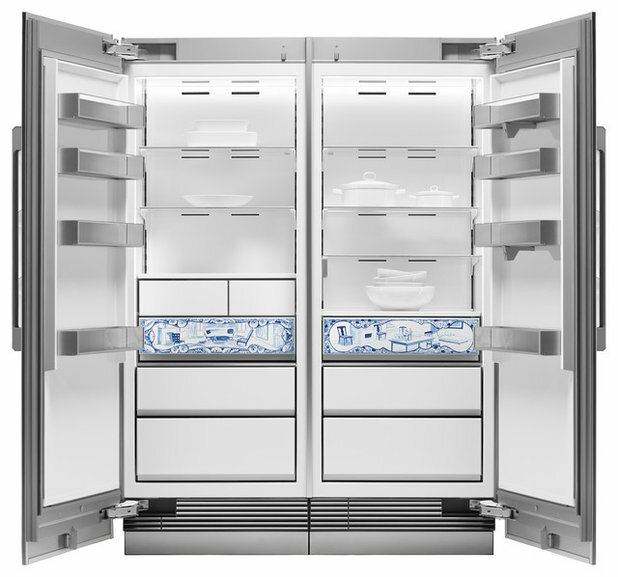 The interior of the refrigerator and freezer features porcelain columns and decorative drawer fronts. 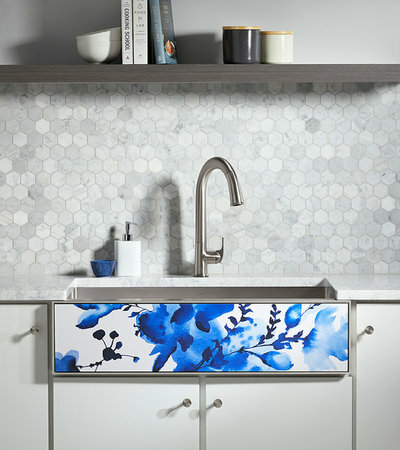 The decorative drawer fronts seen in this image were designed by artist Ann Agee, who often works with blue-and-white ceramics. The decorative panels are customisable, so homeowners have the option for Dacor to add a family crest or a specific design. 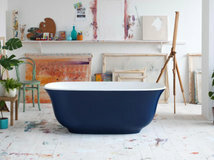 Kohler introduced its customisable Tailor farmhouse sink, which has a changeable decorative front panel. 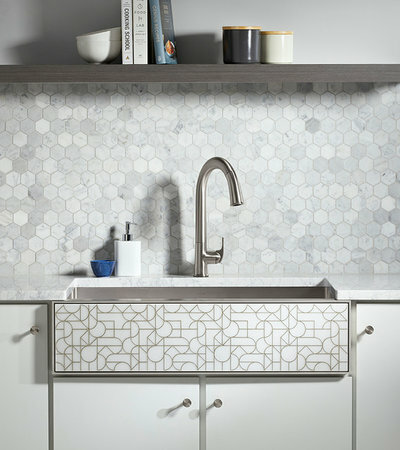 Homeowners can choose one of Kohler’s six decorative panels, ranging from floral to geometric designs. This panel is called Light Floral. Alternatively, customers can insert their own material – such as a matching benchtop material or tile – into the panel slot. Here’s a look at the same sink with Kohler’s Etched Stone insert. Which of these new surface trends pique your interest? Tell us in the Comments below, like this story, save the images and join the conversation. Love the look of textures surfaces BUT they are dust collectors. Imagine the grunge that will collect in the curved wall tiles. Re the Ann Sachs lilac tiles. Would that circular design be considered art deco? 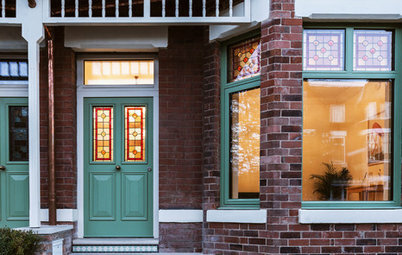 Wow those decorative panels look amazing! Great job! I can only imagine what that would look like in a wood form - may just have to try that! 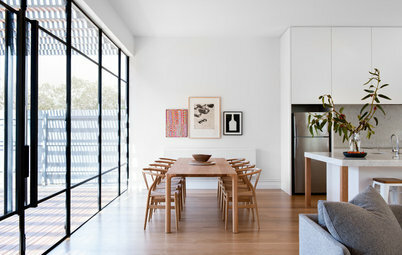 Flooring How Do I... Care for My Timber Floor? Architecture What Do I... Need to Know Before Knocking Down Walls in My Home?